Brazil Cerrado is a smooth, pleasant coffee, rich in flavor but not too strong. It is considered a very well balanced coffee for an afternoon break. It has a deep rich taste,with little aftertaste. This coffee is a favorite among coffee drinkers who like a good cup of coffee that is not too strong but not too weak in taste. The coffee is an excellent choice for afternoon espresso. 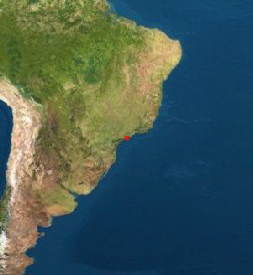 The Cerrado is a vast tropical savanna eco region of Brazil, covering 740,000 square miles. The Cerrado is characterized by an wide range of plants and animal bio diversity. It is considered the richest savanna in the world. This region produces 59% of Brazilian coffee. The climate is hot and semi-humid. More that 1600 species of mammals, birds and reptiles live in this region. **There are about 180 reptile species, 113 amphibians, 837 birds species and 195 mammals.